Researchers and policy-makers alike increasingly recognise the importance of engaging diverse perspectives in implementation research. This roundtable discussion presents the experiences and perspectives of three decision-makers regarding the benefits and challenges of their engagement in implementation research. The use of participatory monitoring and evaluation (M&E) approaches is important for guiding local decision-making, promoting the implementation of effective interventions and addressing emerging issues in the course of implementation. In this article, we explore how participatory M&E approaches helped to identify key design and implementation issues and how they influenced stakeholders’ decision-making in eastern Uganda. Many approaches to improving health managers’ capacity in poor countries, particularly those pursued by external agencies, employ non-participatory approaches and often seek to circumvent (rather than strengthen) weak public management structures. This limits opportunities for strengthening local health managers’ capacity, improving resource utilisation and enhancing service delivery. This study explored the contribution of a participatory action research approach to strengthening health managers’ capacity in Eastern Uganda. The Theory of Change (ToC) is a management and evaluation tool supporting critical thinking in the design, implementation and evaluation of development programmes. We document the experience of Future Health Systems (FHS) Consortium research teams in Bangladesh, India and Uganda with using ToC. We seek to understand how and why ToCs were applied and to clarify how they facilitate the implementation of iterative intervention designs and stakeholder engagement in health systems research and strengthening. Effective stakeholder engagement in research and implementation is important for improving the development and implementation of policies and programmes. A varied number of tools have been employed for stakeholder engagement. In this paper, we discuss two participatory methods for engaging with stakeholders – participatory social network analysis (PSNA) and participatory impact pathways analysis (PIPA). Based on our experience, we derive lessons about when and how to apply these tools. Implementation research and the engagement of stakeholders in such research have become increasingly prominent in finding ways to design, conduct, expand and sustain effective and equitable health policies, programmes and related interventions. How to bring together key sets of health systems stakeholders, including affected communities, health workers, health system managers, health policy-makers and researchers, as well as non-state and non-health sector actors, is a critical challenge. Stakeholder engagement plays important roles across intersecting research, policy and management processes, from selecting and defining the most relevant research questions to address policy and management concerns, to designing and conducting research, learning from and applying evidence, making changes to policy and programmes, and holding each other accountable. The articles in this supplement examine some of the tools and approaches used to facilitate stakeholder engagement in implementation research, and describe learning from the experience of the Future Health Systems (FHS) Research Programme Consortium. 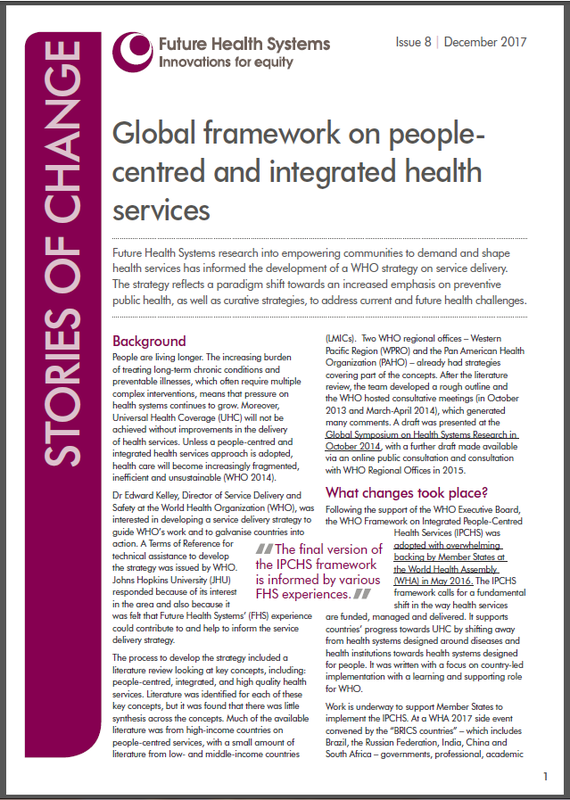 Future Health Systems research into empowering communities to demand and shape health services has informed the development of a WHO strategy on service delivery. The strategy reflects a paradigm shift towards an increased emphasis on preventive public health, as well as curative strategies, to address current and future health challenges. Implementation research (IR) focuses on understanding how and why interventions produce their effects in a given context. This often requires engaging a broad array of stakeholders at multiple levels of the health system. Whereas a variety of tools and approaches exist to facilitate stakeholder engagement at the national or institutional level, there is a substantial gap in the IR literature about how best to do this at the local or community level. Similarly, although there is extensive guidance on community engagement within the context of clinical trials—for HIV/AIDS in particular—the same cannot be said for IR. We identified a total of 59 resources by using a combination of online searches of the peer-reviewed and grey literature, as well as crowd-sourcing through the Health Systems Global platform. The authors then completed two rounds of rating the resources to identify the ‘10 best’. In this short video, FHS CEO, Sara Bennett highlights some of the headlines from FHS activities during its second phase. Throughout the duration of the Future Health Systems project (FHS), country teams have committed to undertaking systematic learning though implementation research and by bringing together key actors involved in service delivery. In this Key Message Brief, we share some examples of how FHS teams have embodied a “learning-by-doing” approach, and what the consequences of this approach have been. Given the rapid evolution of health markets, learning is key to promoting the identification and uptake of health market policies and practices that better serve the needs of the poor. However there are significant challenges to learning about health markets. We discuss the different forms that learning takes, from the development of codified scientific knowledge, through to experience-based learning, all in relationship to health markets. Growth in the use of real-time digital information for monitoring has been rapid in developing countries across all the social sectors, and in the health sector has been remarkable. Commonly these Real Time Monitoring (RTM) initiatives involve partnerships between the state, civil society, donors and the private sector. This article proposes the development of an effective learning and action agenda centred on the adoption of common guidance.